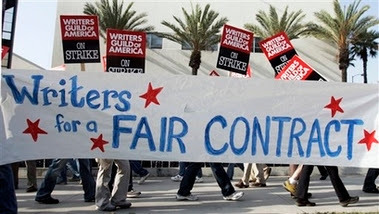 So today we are going to spread around the brownie points in honor of the growing blogger support for the writers' guild strike. Also some love for those blogging to show their non-guild writer's support for the fight against studio greed. One blogger comments that a division between studios and the better writers may find those writers using the internet to sell direct to the fans and cut out the studios themselves. Interesting concept. Elsewhere, it's plain to people that the advent of webisodes aren't an advertisement for a show but just allow networks not to pay writers. And here's one blogger's letter in support of the strike to the AMPTP. Brownie points even for the hot Republican chicks who quote Ann Coulter. The strike goes to the heart of respecting work again in this country. What the guild has been seeking in negotiations is "exceedingly reasonable" to Republicans who read up on the issue, and it's great to see there's some hope labor issues can be seen as nonpartisan. Even though the actors of the Office have shut down their show in support of the WGA by calling out sick, it's great to see the overwhelming support of their fans. We even have a mega-site now for all fans to show their love, so check it out!! Read somewhere else recently about the Panera picnic party for the BSG writers at Universal you mentioned earlier, sounds like fun! When is it exactly? Would love to try and swing by to meet some of you guys! Let me know the details when you can and thanks for all your posts about the strike...que viva la union!